Combine saffron threads and 3 tablespoons of warm water in a small bowl and set aside. In a medium pot, bring the broth to a simmer, then reduce the heat and keep at a low simmer until needed. 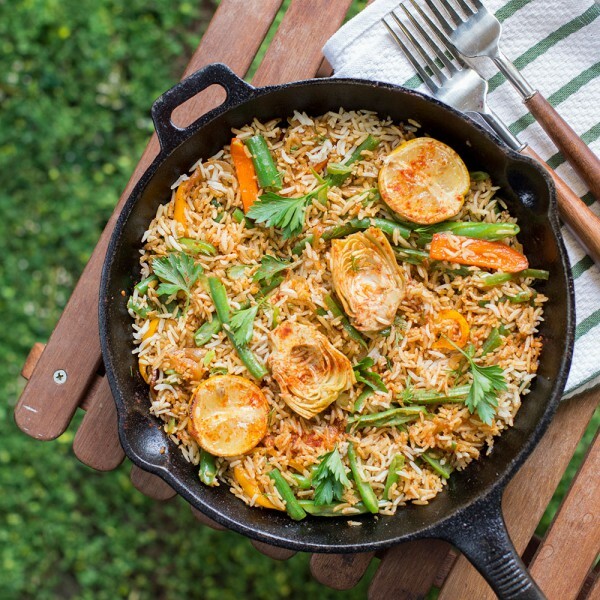 Meanwhile, heat the GrapeOla® Grapeseed Oil in a large cast iron skillet, and sauté the onions until soft and fragrant. Add the garlic slices and peppers. Cook until soft, about 7 minutes. Mix in the crushed tomatoes, tomato paste, hot paprika, saffron threads (along with the water), and season generously with salt and freshly cracked pepper. Let it cook for a few minutes. Make sure to have your vegetable broth simmering nearby. Fold in the green beans, artichoke slices, and chickpeas. Then, stir in the rice. Ladle the simmering broth over the rice. Bring to a boil and simmer for 20 minutes, or until the rice is tender and the liquid has evaporated. A few minutes before the rice is fully cooked, scatter the peas over top. Sprinkle with parsley just before serving.